International bridal designer Sassi Holford opened her first boutique in 1994. Located in Taunton, it is now the place for brides across the South West. The boutique is one with an understated elegance that is echoed from the moment you walk through the door and the team have become renowned for their first-class service and the stunning selection of bridal gowns from designers across the globe. 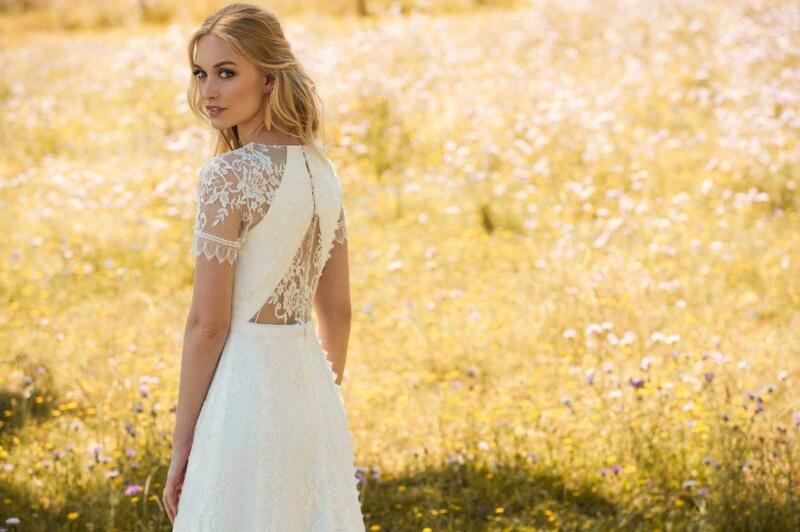 Labels currently include Sassi Holford, So Sassi, Pronovias and Eliza Jane Howell. Bridesmaids are very well looked after too, with beautiful gowns from SassiB Bridesmaids – a brand new collection of bridesmaids’ dresses, handmade in the UK. Sassi Holford Taunton will be showcasing gowns from the stunning new 2018 Collection from Sassi Holford. They say fashion comes and goes but style lasts forever. Young’s Hire knows a thing or two about style and how to make you look great on your big day. From slim-fit tailcoats with tweed check waistcoats and neckwear, to the classic herringbone short jacket, you’ll find something to cater for every taste. You can even build your own outfit online and try it on for free to make sure it’s the perfect match. Build your outfit today or find your nearest store at www.youngs-hire.co.uk. With more than 200 stores nationwide, there’s one near you. The Ivory Secret is a family-run bridal boutique based in Crediton near Exeter. The business has been offering its personal and exclusive service to brides-to-be in the South West for more than six years. The Ivory Secret’s treasure trove of stunning gowns include renowned designers, Annasul Y, Catherine Deane and Belle & Bunty, as well as in-house label, Eleanor Rafferty. The collection is hand-picked with the discerning bride in mind, showcasing a range of styles to celebrate individual personalities. There is also the option of having your bespoke dream dress designed and made. You can also find all the finishing touches for your bridal look: beautiful shoes by Rachel Simpson and Rainbow Club, ethereal Joyce Jackson veils in all different lengths and finishes, and the most exquisite jewellery and hair accessories by Agnes Walker and local jewellery designer Kye Tew. The Ivory Secret is excited to showcase its exquisite designer collections on the catwalk. Find the ideal outfit from ceremony to celebration. Come to discover the perfect wedding outfit from brands such as Phase Eight and Gina Bacconi, Whistles and Reiss. At the catwalk show you will see wedding guest dresses, accessories and hats for a flawless occasion look. Visit the John Lewis stand to talk to the personal stylists about all the styles, trends and brands its womenswear departments have to offer. Alternatively, you can book personal styling appointments in-store, by phone or online at johnlewis.com/personalstyling. There is also a designated occasionwear hub in the Oxford Street flagship and a selection of wedding dresses too. And if you haven’t set up your wedding gift list yet, tick one more job off the list and register for free today at johnlewisgiftlist.com to be in with the chance to win a Kuoni holiday for two to the Maldives. Established in 1980, Pirouette is set in The House that Moved, a 16th Century Tudor house in Exeter’s historic West Quarter. The boutique is a long-standing stockist of the award-winning designers, Maggie Sottero, Sottero & Midgley, Rebecca Ingram and Lou Lou Bridal. Pirouette’s accessory range is from Rainbow Club Shoes (the team are wearing them on the stand) and Richard Designs. Pirouette also carries a range of handmade designs by Kye Tew Jewellery. The featured gowns on the catwalk are by Maggie Sottero, Sottero & Midgley and Rebecca Ingram. Moss Bros. is an editor for men, providing a versatile range of menswear. By drawing upon its 165 years of tailoring experience, Moss Bros. gives in-depth knowledge and suiting expertise, adapting the latest trends while staying true to its heritage. As a brand, Moss Bros. inspires and guides, helping men feel amazing whatever the occasion. The Moss Bros. collections bring you the best of men’s formalwear, spanning hire, ready-to-wear and Tailor Me. A wide range of suits means there’s something to fit everyone’s style – from traditional tails with a twist to the timeless but contemporary Moss 1851 collection and a hand-picked selection of guest brands including DKNY and French Connection. Jane’s is an exceptional and established bridal and occasionwear retailer situated on the Strand in Torquay. Jane’s stocks an extensive range of wedding dresses to suit all sizes and price ranges, including wedding dresses by Romantica, Tiffanys, Goya and Gino Cerruti. No appointment is necessary and you can be assured of fabulous and friendly service in relaxed surroundings. Jane’s also has a range of bridesmaids’ dresses, and mother of the bride outfits and occasionwear by Mascara, Barker & Patticis, Ella Boo and Izabella, along with prom and evening gowns. Lexus and Lunar shoes provide the finest finishing touch at a realistic price. There’s also a selection of hats, accessories and fascinators always available. On the catwalk today, Jane’s will be showcasing the latest bridesmaids’ dresses and wedding guest collection. These, along with the rest of the exciting range, will also be available at Jane’s sister shop, City Dress, opening in Exeter later this month. Lovely is a new kind of bridal boutique, stocking some of the world’s most exciting luxe bridal designers all in a funky, relaxed and fun boutique in Honiton. And because Lovely’s designers are nearly all exclusive to the business in the South West, the brides just love that their perfect dress won’t be seen on every other bride. Lovely brides can choose their wedding dress from stunning collections by Hayley Paige, Charlie Brear, Stephanie Allin, Rembo Styling, Jesus Peiro, Ti Adora and Theia Couture. While your best girls can rock your wedding day too in beautiful dresses from Maids to Measure. Lovely’s award-winning couture accessories designers: Debbie Carlisle, Melinda Rose, Laurel Lime and Freya Rose, will complete your unique wedding day look. So, whether you’re a barefoot bohemian babe, a classic romantic beauty, or a cool fashion-forward bridal goddess, the team at Lovely can’t wait to meet you. With 20 years of bridal expertise the award-winning designer, Kate Walker, reveals her 2018 collections from designers Augusta Jones, Louise Bentley, Lou Lou Bridal and her exclusive bespoke signature collection which is handmade at Kate’s beautiful boutique in Honiton. Stunning designer accessory collections by Miranda Templeton, Joyce Jackson, Rainbow Club and Starlet Jewellery are also available and shown on the catwalk too. Offering a truly unique and personal experience with purely one-to-one appointments, Kate works with each bride personally to provide a bespoke service. Many design changes are also available to ensure that each bride’s dress is completely individual. Kate and her team will be delighted to meet you and talk you through the fabulous designer gown collections on stand 332. We welcome all the models back on stage for an unforgettable finale. Bride: The Wedding Show is at Westpoint Exeter on October 7 and 8, 2017, from 10am-4pm. The show brings together more than 160 inspirational suppliers under one roof. As well as the sensational choreographed catwalk shows taking place at 11.30am, 1.15pm and 3pm each day, there will be a marquee of wedding transport, live music performed on the cafe stage, competitions, deals and discounts and goody bags for the first 100 brides through the doors each day.